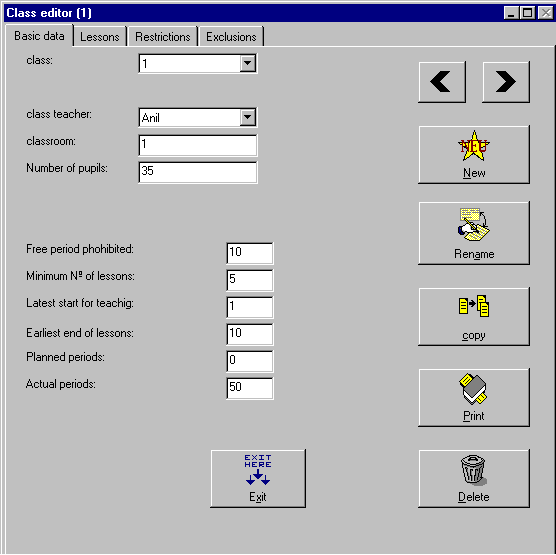 This is the window of Class editor. For a description of the buttons please scroll down. Here you can create new classes and enter the general details. Here you can enter the number of lessons of the class with their respective teachers. Here you can enter the times at which the class has restricted period. Here you can specify groups of courses, which are not allowed to be placed on the same day. This button will allow you to move to previous class. This button will allow you to move to next class. This button will allow you to create a new class & enter its general details. This button will allow you to rename the class. This button will allow you to copy the existing class. This button will generate a control output for the class. This button will allow you to delete the class. This button will exit from class editor and return to main screen of TURBO-Planner.